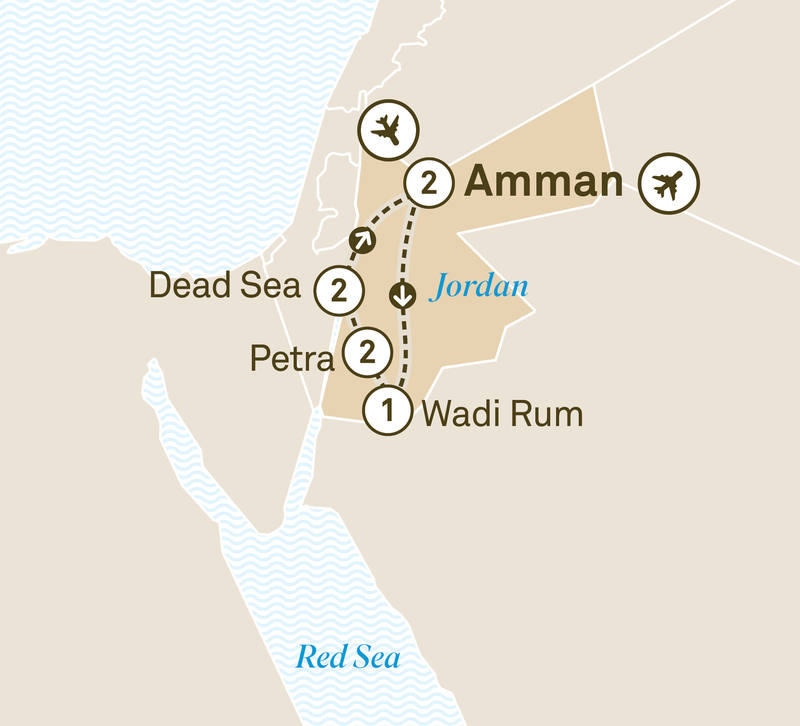 The vibrant Kingdom of Jordan is at the crossroads of Asia, Africa and Europe with Nabataean tradesmen, Roman legionnaires, Muslim armies and Christian Crusaders all leaving their mark over the millennia. Go in search of antiquity and the origins of faith as you travel through this remarkable country, from the ancient Roman city of Jerash to Bethany Beyond the Jordan, the site where Jesus was baptized. Marvel at intricate mosaics and lose yourself in the otherworldy beauty of the desert at Wadi Rum. And just when you thought you had your fill of ancient wonders, the first sight of the magnificent Treasure at Petra will leave you speechless. Discover the ancient Roman city of Jerash, inhabited since the Bronze Age. Explore the impressive ruins and witness an exciting re-enactment of a Roman chariot race in the hippodrome. This afternoon join your Tour Director for a walk through the food and produce markets and stop to taste some traditional Jordanian sweets. At Madaba discover the famous mosaic map of the Holy Land and visit the Madaba Institute for Mosaic Art and Restoration. Continue to the dramatic desert landscapes of Wadi Rum where you will feel like you have stepped onto the moon during your Special Stay in the luxurious Martian tents of the Sun Camp. Witness the dramatic colours of the desert at sunset over a refreshing drink. Travel in the footsteps of Lawrence of Arabia as you discover the dramatic desert landscapes of Wadi Rum. Explore Lawrence Road and marvel at the vistas of ancient valleys and towering weathered sandstone mountains rising out of the pink and white sands. Continue to the Rose Red city of Petra for your two night stay. An unforgettable sight awaits as you visit the Treasury and chasms lit by candlelight. This magnificent World Heritage-listed city is the legacy of the Nabataeans, who settled in southern Jordan more than 2,000 years ago. The impressive eastern entrance leads through a brilliantly coloured narrow gorge to the imposing Treasury, more than 40 metres high. Designed to impress, the rock-cut facade will take your breath away. At Bethany Beyond the Jordan see where Jesus was baptised then view the memorial to Moses at Mount Nebo. Travel north to your resort for the next two nights on the shores of the Dead Sea. Relax and enjoy sweeping views over the Dead Sea and across to Israel from your balcony. Enjoy the facilities of your resort including direct access to the sea. Spoil yourself and allow the staff to slather you in the therapeutic mud, or float in the hypersaline waters of the Dead Sea, while reading a book or the newspaper.